Jesse Eisenberg is one of those actors who actually admits to having stage fright. Luckily, his role in the new film, Now You See Me, helped him get over his fear. 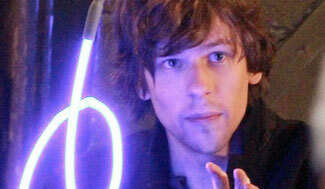 In the film, Eisenberg plays an illusionist who teams up with four other magicians to rob a bank. The role actually ended up helping his performances onstage. “I just finished my second play, The Revisionist, with Vanessa Redgrave, and I was a little more confident doing it,” he said. “I mean, incrementally, but more so, nonetheless. I realized that you can choose to feel confident about it or not, but that’s not necessarily related to how the show goes. You can feel excited all day about performing at night or you can feel miserable all day about it and the show might not be that different. Why ruin your days feeling miserable about something that can possibly go really well? Now You See Me is in theaters now.